On February 6, 21:07:19 UTC, a spectacular detonating fireball lit up the sky over the Greater Copenhagen area. The event was witnessed by people all over Denmark and northern Germany as a bright descending flash of light lasting several seconds. Stationary cameras in Denmark and Germany recorded the bolide’s trajectory, which was roughly SSW to NNO. 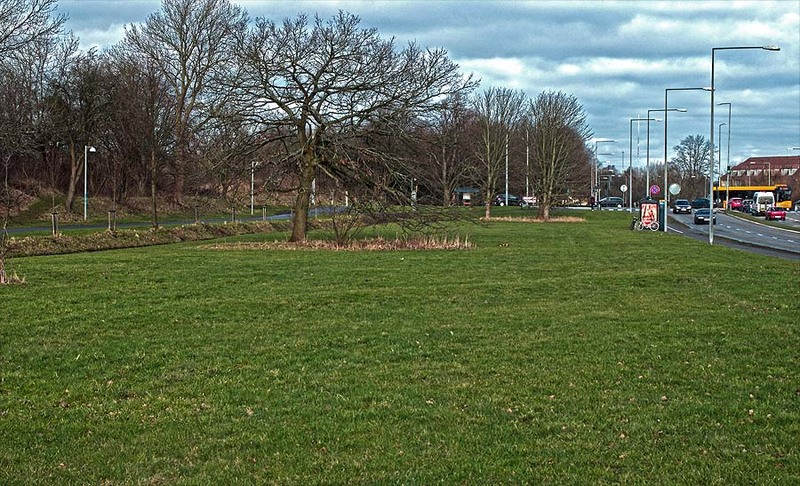 On the ground, in the suburbs of Herlev, Ejby and Glostrup, west of Copenhagen center, people reported having heard thunder claps some time after the fireball had deceased. 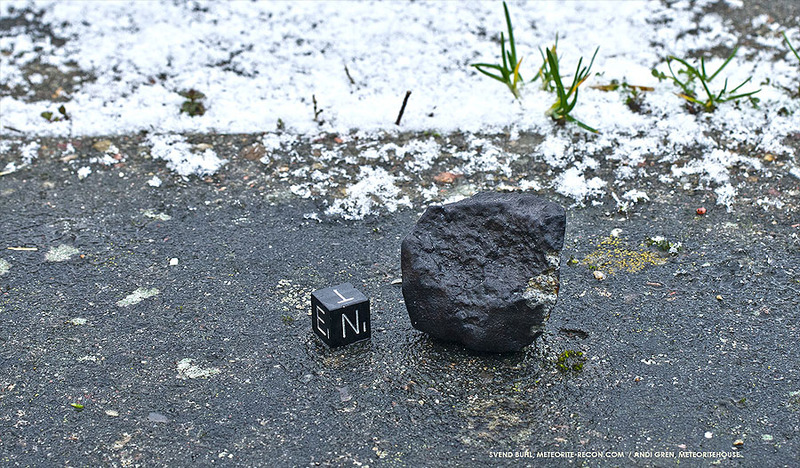 First in situ photo of the 59.5 g mass of the Ejby, Copenhagen meteorite fall, recovered by S. Buhl and A. Gren on Saturday, February 13, 2016, at 10.45 CET in Ejby industrial area. 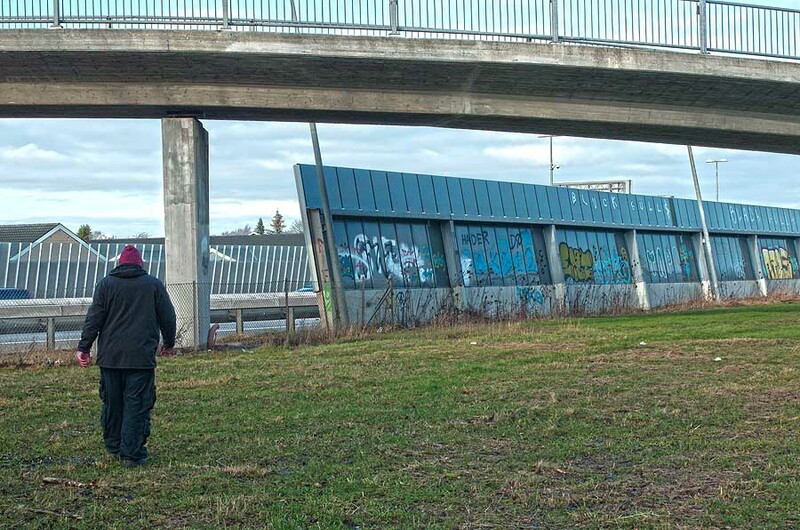 In Herlev, north of Ejby industrial area, 47-year old master bricklayer René Rasmussen sat in his living room when he heard a tremendous crashing sound, which he took for a traffic accident on the nearby road. It was only the next morning, after he had learned about a possible meteorite fall, that he discovered an impact pit and shattered fragments of stone in his yard. He contacted Daniel Wielandt from Naturhistorikse Museum, who undertook a survey of the impact site and confirmed the fragments as meteoritic. The mass, with a total weight of ~ 6.5 kg, had struck the concrete paved floor with a terminal velocity of ~300 km/h, fragmenting on impact, ejecting debris up to 16 m away. Documentation of the meteorite in its find location. 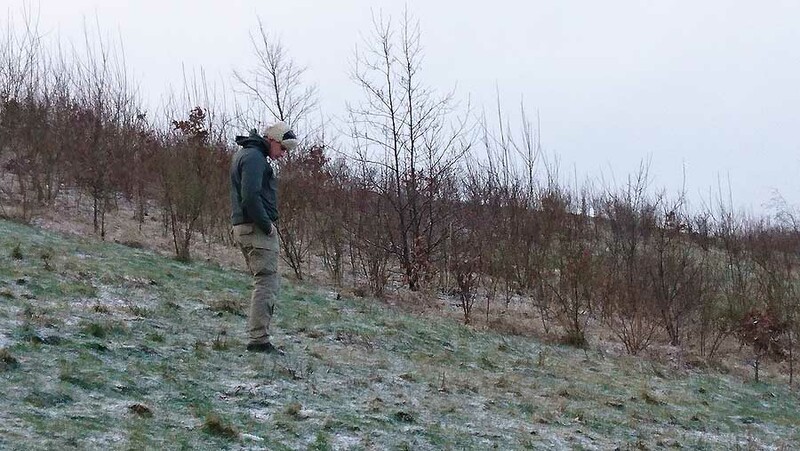 Had we searched the spot earlier in the morning, the meteorite would have been covered by the slowly thawing snow. 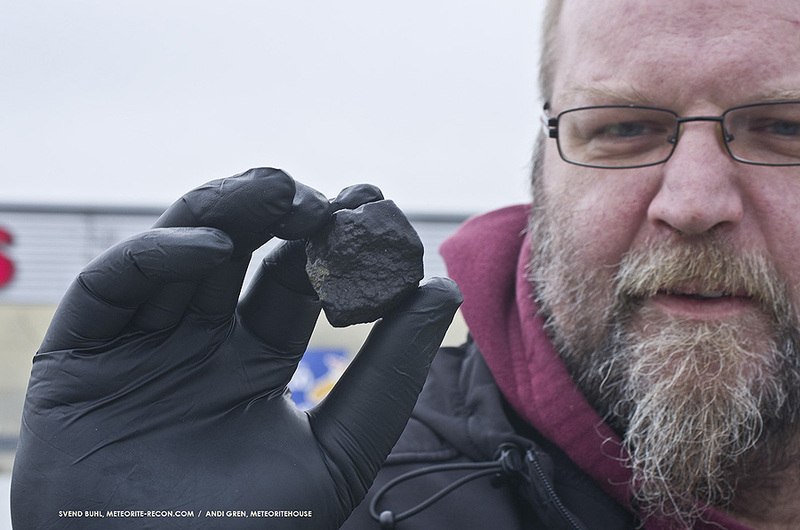 The 59.5 g meteorite in situ on a parking lot. The specimen is wet from thawing snow and probably got its share of salt spray from the vehicles passing by. Photo taken several minutes after the find on February 13, 2016, 10.55 hrs. Green patches are rather few in the eastern part of the strewnfield, the belt running east of Fæstningskanalen being an exception. Built from 1886 to 1888, the canal, which is behind the tree line in the picture, was constructed as an element of the fortification belt and part of a plan to flood surrounding areas in case of an attack on the city. In the course of the following days, more specimens of the fallen meteorites were found in the surrounding suburbs of Ejby, Glostrup and Vanløse. For a detailed and up-to-date overview of the individual finds visit Martin Karmaka’s page here. On February 9, apart from the shattered main fragment, three additional masses were known. An individual mass of 65 g had been found by 6-year old schoolgirl Melina Hybel Jensen on the schoolyard of Skovangsskolen in Glostrup. After she had discussed the meteorite event with her parents, they had encouraged her to keep looking for black stones. On Monday, February 8, Melina had found the meteorite next to her brother’s classroom. 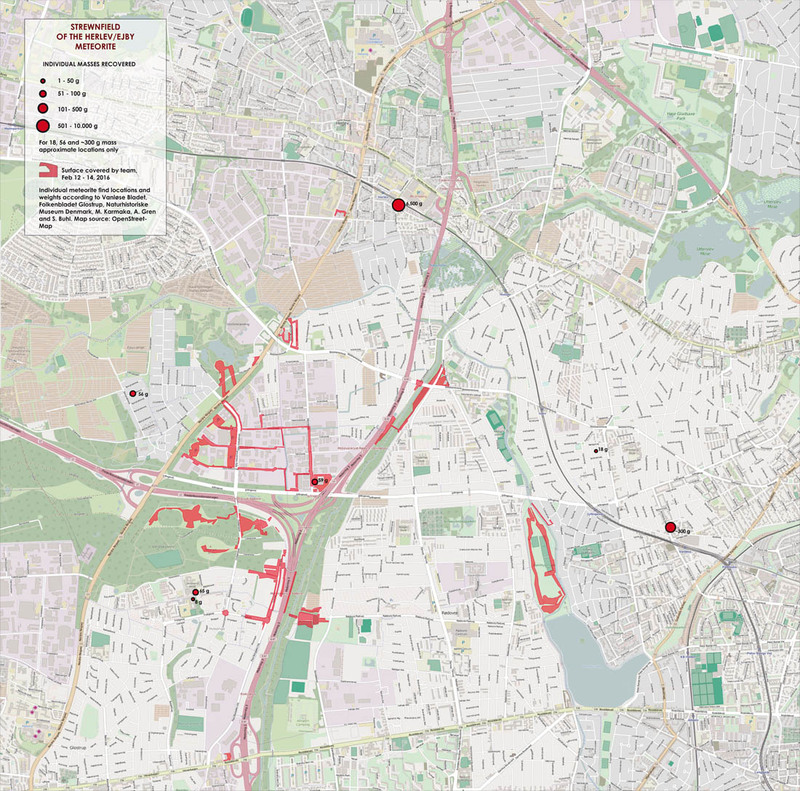 Other pieces of 56 and 300g respectively, had been recovered in residence areas in Ejby and Vanløse. 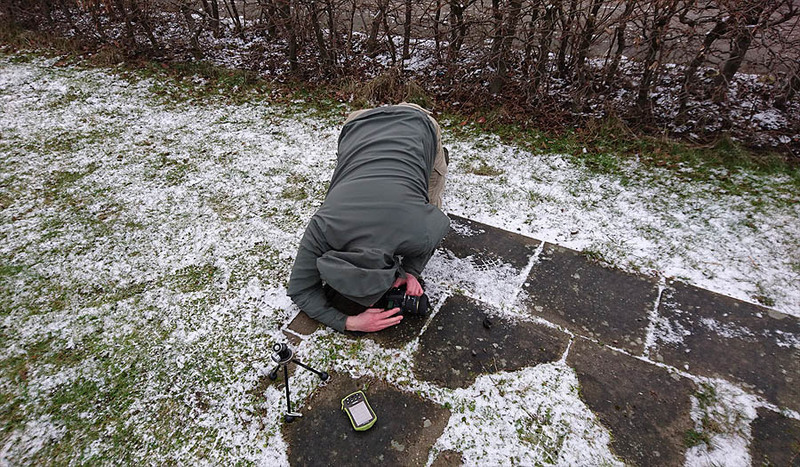 Together with Andi Gren (meteoritehouse), I decided to visit the fall site and search for further fragments of the Herlev / Ejby meteorite. We headed for Copenhagen on the evening of February12, six days after the event. With only a few specimens found despite the densely populated area, we were aware that chances to find new fragments were slim. If any were left to discover, they would be distributed few and far over an immense surface area of roughly 80 km2. Yet, we arrived in Glostrup full of hopes and in bright spirits. That changed the next morning, when I opened up the curtains of my hotel room and was shocked to see that a blanket of snow had covered the ground over night. Although thin, it had drenched everything, including potential meteorites, in a blinding white. “The Danes got this wrong bro. It’s first the snow, and then the meteorites …” was Andi’s dry comment. We started to search nevertheless, but soon had to give up on the pastures we had chosen in the north-eastern Glostrup area. While the snow cover was thin, every object on the surface was covered, and neither shape nor true colour could be discerned from the distance. Instead, we drove to the 1 km-distant Ejby industrial area and parked in Produktionsvej to walk the many parking lots. The Danes are tidy people, and most of the walkways and parking space were salted and thus free from snow. According to the GPS, we walked six kilometers in an area roughly the size of two football fields, before we re-located once again. Our target was the parking lot of a Toys R’ Us store in the south-east Ejby industrial area. 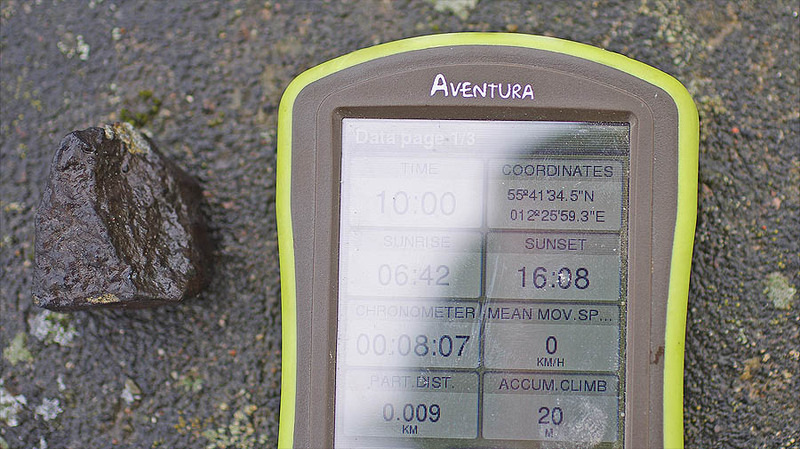 Upon pulling on the parking lot, the clock showed 10.45 a.m., I spotted a small dark rock on some concrete tiles. “There lies another one”, I pointed out to Andi. However, after getting my gear together, I spotted another dark object close to the car-wash on the same parking lot, and walked over to it, barely keeping the other stone in the back of my mind. Andi instead, did the only right thing and walked straight up to it for a closer inspection. It took some time until the thought that we had found us a meteorite, seeped into his mind. Lost in thoughts, still walking between parked cars, I heard him call after me. When I looked up, he performed some kind of Hula-Hoop dance. That clearly brought the message across: We had found one! The stone was a beautifully crusted individual of 59.5 g featuring four surfaces with primary fusion crust and two with a thin secondary rind and less ablated texture. Two edges showed delicate roll-over rims, where melted material had escaped ablation and accumulated on the temporary lee-side of the ablating meteorite. The largest primary surface showed a reddish hue, indicating a low oxygen environment in the trailing near-vacuum at the moment of transition from the ablation to solidification phase of the fusion crust. A small chip had detached, probably on impact, but as much as we searched we could not find it. Our assumption was that the rock had hit the parking lot and ricocheted over the curb and onto the paved spot where we had found it. After documenting the meteorite in situ, we continued to search the closer surroundings and the adjacent streets. According to my GPS, in two days, each of us walked short to 60 kilometers in the strewnfield. However, that was it, and we were not rewarded with an additional find. Apart from up-to-date information on new discoveries from the strewnfield that Martin Karmaka fed us, we were in close contact with Karl Wimmer, who was constantly working to refine and detail his fragmentation and wind-shift scenario based on high-altitude soundings for the time of the fall. Already in his first approximations, Karl had arrived at the conclusion that successive catastrophic fragmentation had resulted in considerable transversal velocities of the resulting fragments, causing extensive lateral displacement of these masses in relation to the trajectory azimuth. In combination with strong WSW altitude winds, this lead to a complex and irregular mass distribution pattern of the strewnfield. Before we embarked on our journey to Denmark, Andi Gren and I were aware of the Danekrae, the Danish law governing meteorites and other objects of natural History. According to the law introduced in 1989, meteorites discovered in Denmark are dispossessed of the finder and considered property of the Danish state a priori. For us, this meant that, even if we succeeded, it was doubtful whether we would be able to keep any of the material discovered. 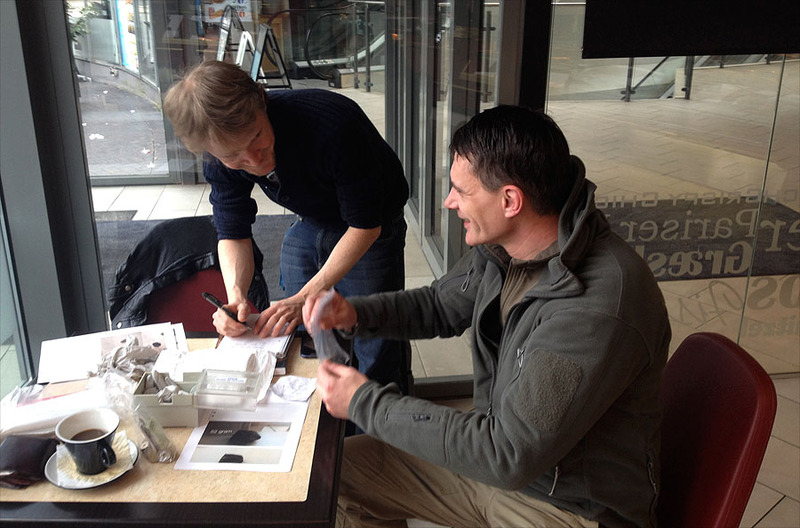 In compliance with the Danekrae, and quite curious how this cooperation would work out, we handed our find to Dr. Daniel Wielandt of Naturhistorikse Museum on Sunday, February 14. In the case of other objects of scientific and museal interest, such as fossils and minerals, the Danish government reportedly handled individual cases foresighted and with a quite liberal approach: In many cases, natural objects had been returned to the finders after it was decided that national Danish collections already kept specimens of equal quality and that further scientific research could be conducted without a need for additional specimens. With meteorites, there had only been one precedent in the past: The case of the Maribo / Lolland meteorite, discovered by German Thomas Grau. This Meteorite fall had, however, consisted of a single individual only. The meteorite was therefore received by the government and a reward was paid to the finder. Ejby is difficult to compare, as numerous fragments and individuals have been recovered and handed over to Naturhistorikse Museum Denmark, there is already sufficient material for research and exhibition available. Modern chemical, petrographic and isotopic meteorite research can be undertaken with very little sample material and many methods even work destruction free. Museums can exhibit a limited number of specimens only. Given a total mass of ~ 7 kg, there might be hope after all, that finders like us, who prefer meteoritic material over a financial “reward”, eventually are able to keep their discoveries, or at least are compensated with material from other recovered masses of the same fall. 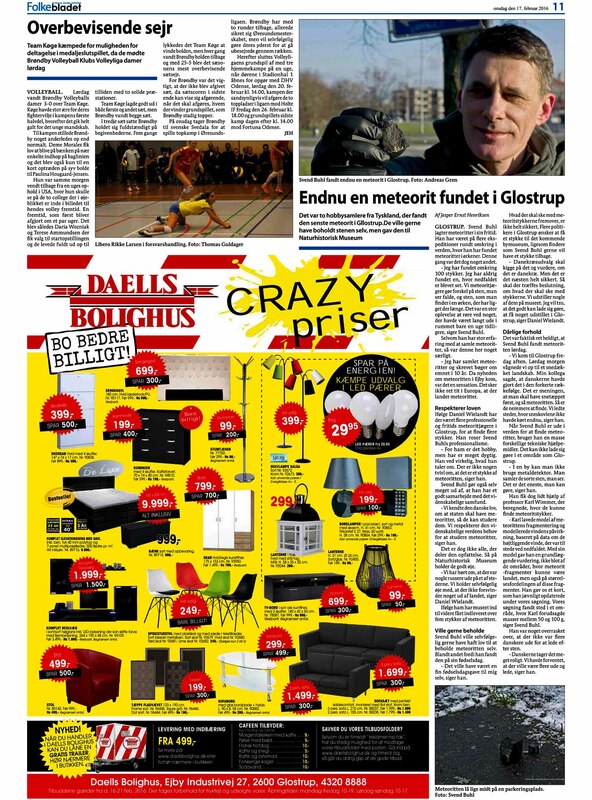 It remains to be seen, how the Danish government handles the issue in the present case. Without doubt, its verdict will have a strong signal effect to the international meteorite community. Given the skill, time, money and effort that is necessary for the purposeful and timely recovery of meteorite falls, any compensation that fails to honour the finder’s engagement appropriately, will severely affect the willingness of future finders to cooperate with the national institutions and hand over their finds. Meteorite recovery is only effective as a collaborative effort of both private individuals and institutions. Institutions alone, rarely have the manpower, capacity, funding and flexibility to field effective recovery campaigns on short notice, as required with meteorite falls. Thus, in the case of meteorite falls, professional researchers are dependant on the cooperation with amateurs and the public. The application of the Danekrae in the case of the Herlev / Ejby meteorite fall will become a litmus test whether the law in place is sufficiently flexible and foresighted to advance this cooperation in the future. As finders concerned, we hope that the decision will benefit the interests of both, privately funded meteorite enthusiasts and public institutions alike. We will report here, how the case ends.